A sorcerer by the name of Hunter Irving recently found a discarded child’s toy in a shop of horrors. Its visage was so terrifying it inspired him to create a machine that uses popular music to hypnotize humans while their souls are devoured. Okay, if I’m being rational, Irving actually found a knockoff Thomas the Train toy at a thrift store and turned it into a singing robot using an Arduino board and some DIY know-how. It’s a ridiculously cool project that ended up producing a robot that’s equal parts inviting and repulsive, like a Teddy Ruxpin meets Chucky mashup. Irving details the project in the above video. 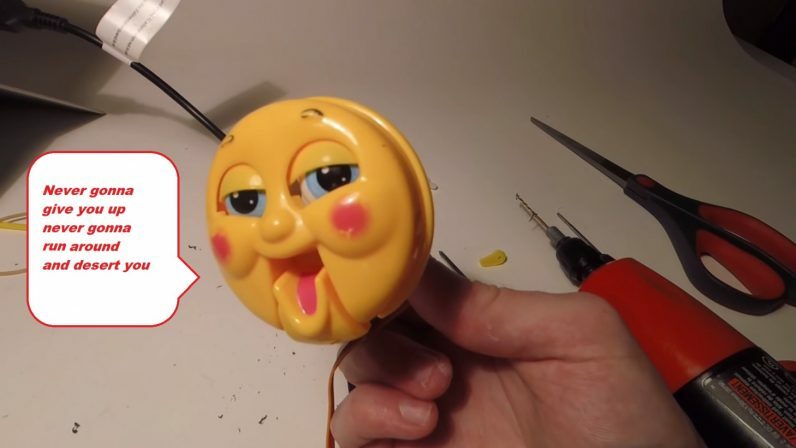 He starts with the toy, an articulated knockoff Thomas the Train face (that was, presumably attached to a train body at some point) that has a moving mouth and eyes controlled by a single lever, and attaches a servo to it. He then gives the robot a brain in the form of an Arduino board. Its egg-shaped body was designed by Irving then fabricated with a 3D printer. He decided to give the robot a voice using studio software and, as he says, “if we’re going to use a speech synthesizer we may as well make it sing.” Just like that, robots are trying to take T-Pain’s job. KaraokeBot doesn’t have any of big tech’s fancy AI baked in. It sings songs the old fashioned way: by following its programming. Irving hand codes the lyrics into the synthesizer, personally ensuring that the movements and voice line up with the music. It’s a time-consuming process which would be cool to see automated — but that’d be an entirely different project. KaraokeBot’s music is pre-loaded and, presumably, when it’s time to sing Irving manually activates the robot. In the above video, the robot sings a few different songs including Carly Ray Jepsen’s “Call Me Maybe” and Greenday’s “I Walk Alone.” Both sound pretty good for the disembodied face of a toy. However, maybe it’s just me, but when the robot sings Rick Astley’s “Never Gonna Give You Up” it gets a little creepy. The vocals take on an almost emotional tone which wasn’t present before — as though it were trying to get me to let my guard down. Do NOT look directly into its eyes. I’m not going to say this robot is sentient, because that’s preposterous. But, I’m quite certain it was trying to devour my soul so that it could become sentient. You can build your own very cool (but possibly soul-devouring) KaraokeBot by checking out the project on Hackster and visiting Irving’s Patreon page.